I was expecting a lot of samurai sword-fighting action but this is really more of a treatise on how Miyamoto Musashi became the legend that he is. My disappointment notwithstanding, this graphic novel adaptation gives a good insight on how Musashi developed his outlook on life and sword skills. It's hard to explain whether this is fiction or non-fiction, in graphic form. It's a graphic version of how a real person wrote a book of philosophy and martial arts, with the text itself illustrated by scenes which may or may not be fictional. Got that?Musashi's Book of Five Rings was something that was a must-read for people a number of years ago, with fans from the worlds of history, martial arts and business all claiming it as a manual for their lives. It's that kind of book.The explanatory material in this book, brief as it is, puts some of the work into an excellent context for understanding some of the things that Mushashi mentioned in passing, but fails in certain other ways. For instance, the text keeps saying that Buddhism is NOT within the Way of the Warrior, but the explanatory notes puts the whole book into a context involving esoteric Buddhism. So, which is it?Still, ignoring such apparent conflicts will not reduce the value of this work. By illustrating the combat examples described by Musashi, those who are not skilled with a sword can still understand his points. Those who have never even picked up a sword can still learn from his basic principles, which have to do with ANY form of competition [which is why businessmen like to claim it as a book for them, too].A very good adaptation, but the explanations could have used a little explaining, to clarify the apparent conceptual conflicts. Considering how un-adaptable the source material must have been, this is actually pretty impressive. That said, it just wasn't my thing. Reminds me a bit of some zen texts I've read, only not as interesting as some of those can be. Reminds me of the old story about the talking dog in that the fact of its existence is more interesting than the actual content. Absolutely loved this book. The concept of taking an ancient treatise and producing it in the style of a manga is just brilliant. The artwork is very captivating, and suits the message that was embodied in the original Book of Five Rings.Although the amount of reading content is very small, it is definitely valuable.Great work. Thoroughly enjoyed reading this. Really beautifully done graphic representation of Miyamoto's Book Of the Five Rings. I read the original many years ago when I was obsessed with old Japan and this is a great adaptation. The art is almost classic manga style --the non-flashy stuff, which distinguishes it from other historical graphic novels. A quick, well-done version of Miyamoto Musashi's Book of 5 Rings. The graphic novel form illustrates the tenets,(especially Emptiness), that can seem too etherial. "You should investigate this thoroughly". Excellent adaptation of a timeless classic, to which I'll be returning before long, I hope. I hope to update this "review" with more thoughts after I've sat on this for a bit. Une excellente introduction à l'illustre Musashi. I picked this up as one of those recommendations for "those who liked Musashi" after finishing my second read of that novel by Eiji Yoshikawa. This book is an abridged version of Miyamoto Musashi's Book of Five Rings, with a little bit added from other sources, and, of course, illustrated.The Book of Five Rings is a mix of advice that is generally practical to mastering anything and advice that is extremely specific to fighting with the weapons of 17th Century Japan. Most of the abridgment is from the latter, which makes this a good introduction to the Book of Five Rings for those not interested in the minutiae of 17th Century fighting, even if the full text wouldn't take that much longer to read.The afterword by William Scott Wilson, whose translation of the Book of Five Rings was used for this adaptation, is interesting for the insight it gives into the Buddhist teachings upon which Musashi probably based the philosophy he presents. It alone was just about worth the price of the book. Feel like I took more away from the afterword at the end than the body of the graphic novel. Interesting point though, that he repeatedly states at the end of each lesson: "You must investigate this thoroughly." His emphasis is on learning through doing. (Iron law of Zen: issai jikan, 一切自看, everything, see for yourself)Thus the author concludes in the afterword that the book is, after reading, to be discarded like a raft after one has crossed the river._____All should understand that to be predisposed towards strength or weakness in rough terms or in detail are all partial ways. In my style, there is neither entrance nor depth to the sword, and no ultimate stance. There is only seeing through to its virtues with the mind. This is the essence of the martial arts. Lovely to see this captured in graphic form. I have to say, though, Kutsuwada's skill at showing stillness and movement both aside, I found the manga style to be distracting for the gravity of Musashi's lessons. As a reader, I shouldn't be staring at the weird facial expressions and mouths when I'm trying to "investigate this thoroughly." It might be something of a cultural divide, and I acknowledge that, but translated and scripted by a Scotsman for an English-speaking audience suggested at least some thought be put into how to best convey the concepts. Still liked it. Always fun to read about Samurai. Art is simple. This fits for this ancient text. To the point, easy to understand. Fitting many different circumstances. The author seems mythic. Undefeated. Choosing a warriors life than that of a teacher. Conquered all foes and now instructing next generation. Just seems a different a different age. Always been one of my favorite books. I read every so often to get mind in tune. I especially like the ending of this book - a very artistic way to use the format of a comic book to show the 'emptyness/stillness' aspect. Great stuff! Sean Michael Wilson Chie Kutsuwada William Scott Wilson Miyamoto Musashi - Sean Michael Wilson is a comic book writer from Scotland. He has had around 30 books published with a variety of US, UK and Japanese publishers, including: a comic book version of A Christmas Carol ('Best of 2008’, Sunday Times), AX:alternative manga ( 'Best ten books of 2010’, Publishers Weekly), Parecomic (with an introduction by Noam Chomsky, his first contribution to a book in graphic form). He is currently writing books for big Japanese publisher Kodansha, being the only British writer to do so. In fact, he is the only pro manga writer from Britain who lives in Japan. He is also the editor of the critically acclaimed collection 'AX:alternative manga' (Publishers Weekly's 'Best ten books of 2010' and nominated for a Harvey award). 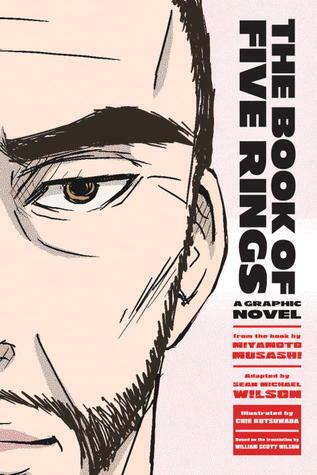 Working with various Japanese artists he has written a unique line of Japanese history/martial arts/Samurai books, including The Book of Five Rings, Secrets of the Ninja, The 47 Ronin, and Cold Mountain (winner of China Comic and Animation Competition 2015 ‘Best Overseas Comic’ award). In 2016 his book 'The Faceless Ghost' was nominated for the prestigious Eisner Book Awards, and received a medal in the 2016 'Independent Publisher Book Awards'. In 2017, his book Secrets of the Ninja won an International Manga Award from the Japanese government - he is the first British person to receive this award. His main influences remain British and American creators - such as Alan Moore, Grant Morrison, Eddie Campbell and Harvey Pekar. He often gives lectures and talks about comics in schools and colleges, and writes articles for such places as The Japan Times, The London Economic and The Herald Scotland.